Complete and Partial dentures are a cost effective way to replace missing, broken, and decayed teeth. Dentures are a removable prosthesis that engages the gums and/or existing teeth and helps return esthetics and function. 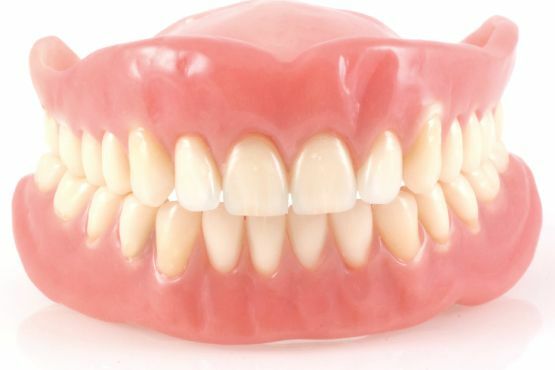 Traditional dentures are made of a durable plastic material and are adapted to the gums for a snug fit. They are custom designed to fit each patient for optimum esthetics and function. The use of implants can help secure dentures in the mouth for improved function. Many denture wearers suffer from loose dentures that limit speech and the ability to eat. Some dentures are never comfortable and irritate the gums when worn. Implants can secure dentures in place when worn, alleviating the common problems associated with dentures. Implants are placed in the mouth with denture attachments that allow the denture to “snap” into place. These attachments hold the denture securely in place during eating and speaking, improving your confidence during daily activities. A revolutionary procedure using dental implants allows the replacement of missing, broken, decayed teeth with new permanent teeth, sometimes in one single appointment. New techniques allow implant placement in patients who previously were not candidates for implant treatment. The new teeth are permanently secured to dental implants and remain in the mouth during the day and while sleeping. Permanently secured teeth have the look, feel and function of natural teeth. With careful planning this revolutionary procedure can often be completed in a single appointment, returning your ability to smile confidently and eat comfortably. With our on-site 3-D imagining at Rejuvenation Dental, Dr. Brent Call can start planning your new smile today!